September is Attendance Awareness Month. It’s crucial for kids to attend school every day. Going to school regularly helps your child do well at school—from preschool through high school. Did you know that absenteeism in the first month of school can predict poor attendance throughout the school year? According to the Baltimore Education Research Consortium, half the students who miss two to four days in September go on to miss nearly a month of school. Students are less likely to succeed in school if they miss 10 percent or more of school days over the course of the school year. That means missing about two days of school per month, or about 18 days per year. Many studies show that attending a high-quality early learning program strengthens school readiness and long-term academic performance. Regular attendance in these programs is critically important for children to become successful life-long learners. Not only will good attendance help build good habits for the children, it can also help alleviate academic problems later on. If a child is absent, they often miss the foundation skills they need to learn the next skill. It can take days and even weeks to then teach the child the skills and catch them up. By that time, they have missed other skills. If they fall behind too much, they may never fully catch up. If children are regularly absent, they may not be fully prepared for school. Preschool is a time for building the social, emotional, cognitive, and language skills needed for school readiness. The BP Early Learning Center in Anchorage, Alaska used to allow infants and toddlers to attend only two days a week. But according to Director Angie Lantz, the Center stopped offering the part-time option. “We found from our experience that for infants and toddlers, part time is hard on the child, hard on the other children, and hard on the teachers. We encourage parents to bring their children every day because infants and toddlers do better with a regular routine,” Lantz said. At quality early care and learning programs, children learn social skills and problem solving. Academics come easier if they have those foundations. Keep in mind that patterns are formed early. It is harder to break a bad habit (children begging to stay home from school “just this once”) than saying “no” in the beginning. Talk to teachers, school counselors, or other parents if your child is worried or nervous about going to school or shows other signs of not wanting to go to school. Develop back-up plans for getting to school if something comes up. Call on a family member, a neighbor or another parent. Avoid scheduling medical appointments and extended trips when school is in session. 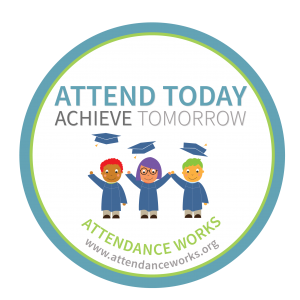 The promotional materials developed by Attendanceworks can be used by your center to promote regular attendance. Accurate tracking of attendance is a major part of providing child care at your center. Licensing. Child care providers are required to follow certain requirements in regard to attendance tracking and reports. It is important that your sign-in/out process is compliant. Conduct a self-assessment of your processes – from parents signing their children in and out every day, completing the forms correctly, and then maintaining these records on file. Don’t wait for a visit from licensing to find out that your sign-in procedures are not compliant. Billing. Accurate attendance records are critical to the financial success of your business. This is particularly true for those children who receive subsidized care through a third-party. The accuracy and completeness of these forms is an important part of participation in the subsidized programs. Errors on attendance sheets may affect your payment. Child-staff ratios. Attendance per age group determines how many caregivers must be present for each child. Attendance reports can provide information as to the average number of children present for each session so that staff hours can be scheduled accordingly. Security. Child care providers are trusted by parents to keep their children safe. Parents and child care providers have to know where their children are and who they are with at all times. It is vital that caregivers ensure that only those who are authorized can sign out a child at the end of the day. Flexible attendance tracking is also a necessity when leaving the center to go outside or for field trips. Without question, attendance tracking is the most important part of your day. Using paper sign-in sheets is inefficient and time-consuming for parents and staff. Child care software such as ChildWatch® makes the sign in/out process quicker, eliminates paper and storage space, and is much easier and secure for parents.